The sun rises and sets farther south along the horizons this month. As seen from the Chicago area, the region loses nearly 80 minutes of daylight during the month. By Halloween, the sun is in the sky about 10 hours, 20 minutes. The chart above shows the change in daylight each month. The red curve indicates the length of daylight throughout the year. The blue shaded area indicates the daylight for October. First Quarter 10/08/16 (11:33 p.m.) 1:37 p.m. 11:38 p.m.
Last Quarter 10/22/16 (3:04 p.m.) 11:10 p.m. (10/21) 1:50 p.m.
New Moon 10/30/16 (12:38 p.m.) 7:04 a.m. 6:10 p.m.
Times are Central Daylight Time for Chicago, Illinois, from US Naval Observatory calculations. Bright Jupiter and Mercury appear in the eastern sky early in the month. Mercury was a its greatest separation from the sun last month. This article outlines Mercury’s appearance. On October 11, Jupiter and Mercury rise at the same time, at the beginning of Nautical Twilight, the time when the horizon can be distinguished from the sky as daylight approaches. They are less than one degree apart. 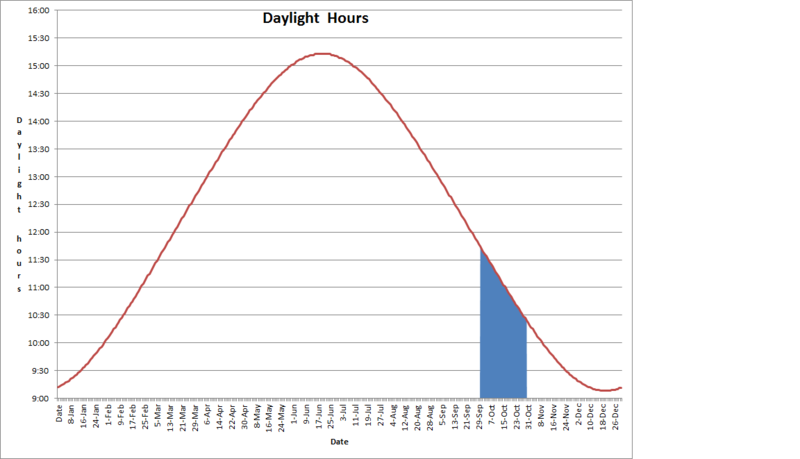 This chart is calculated for 30 minutes before sunrise when the sky is moderately bright. Use binoculars to locate the planets. 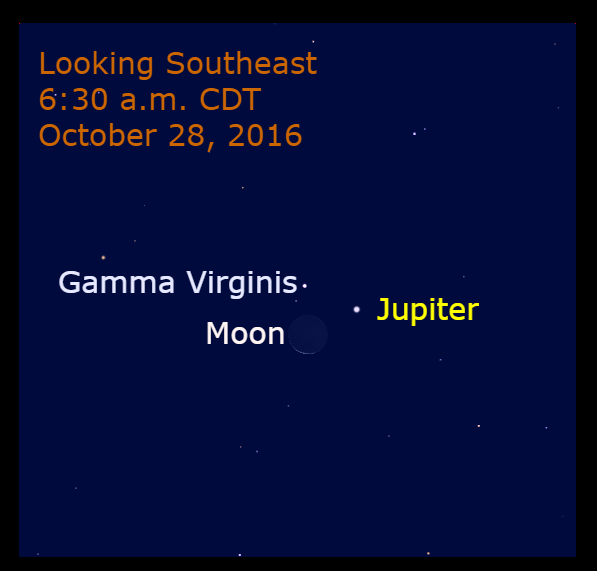 Jupiter was at its conjunction with the sun on September 26 and is rising earlier each month. See this article for more about Jupiter’s appearance. On the morning of October 28, Jupiter passes the star Gamma Virginis and the waning crescent moon is about 1.5 degrees from Jupiter. Venus is easily see in the western sky during evening twilight. It is so bright it looks like lights on an airplane. At the beginning of the month, it sets about 75 minutes after sunset. As it moves toward its greatest separation from the sun, it sets later each evening. On Halloween, it sets nearly 2 hours after sunset. Saturn and Mars appear to the left of Mars and higher toward the south. 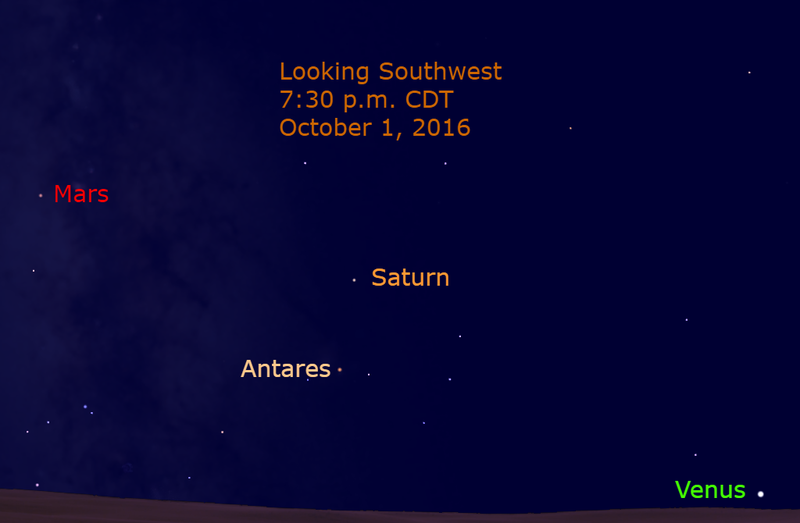 On October 1, Mars and Venus are 52 degrees apart with Saturn in between them. Venus is slowly moving toward Mars. This article explains more about this planetary chase. On October 3, the crescent moon appears with Venus. They are separated by about 2.25 degrees. 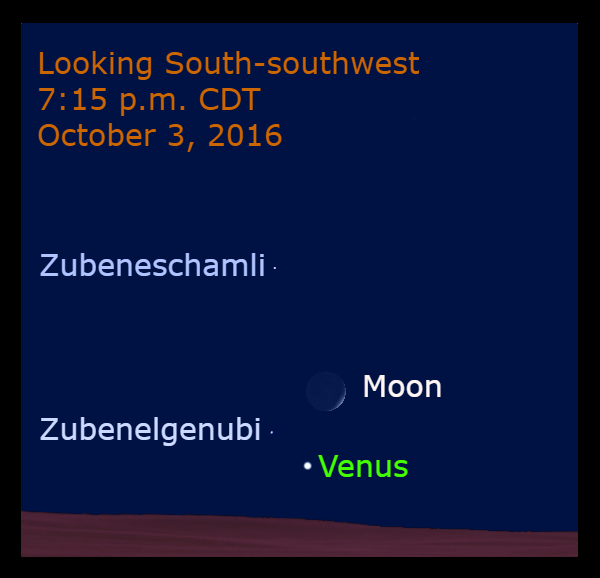 Venus is nearly 3 degrees from the star Zubenelgenubi. On ancient star maps this star and its neighbor, Zubeneschamli, were part of Scorpius. Their names are translated as the Northern Claw and Southern Claw (of the Scorpion). Today they are part of Libra, the only inanimate object that forms the background for the motion of the sun, moon, and planets. 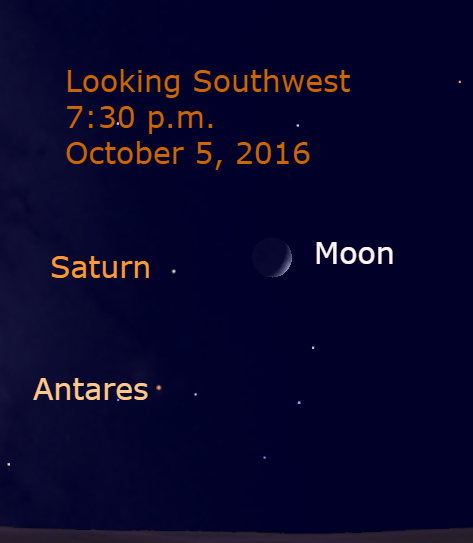 A few nights later, the moon appears near Saturn. 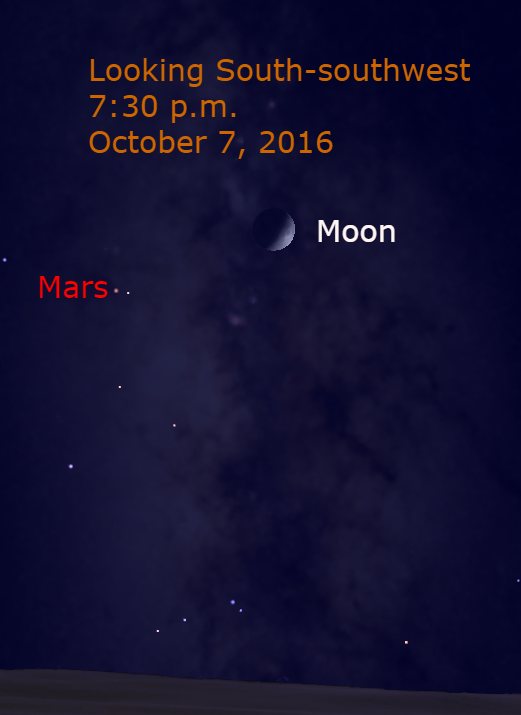 As the moon moves farther east in its orbit and its phase increases, the waxing moon appears near Mars on October 7 and October 8. 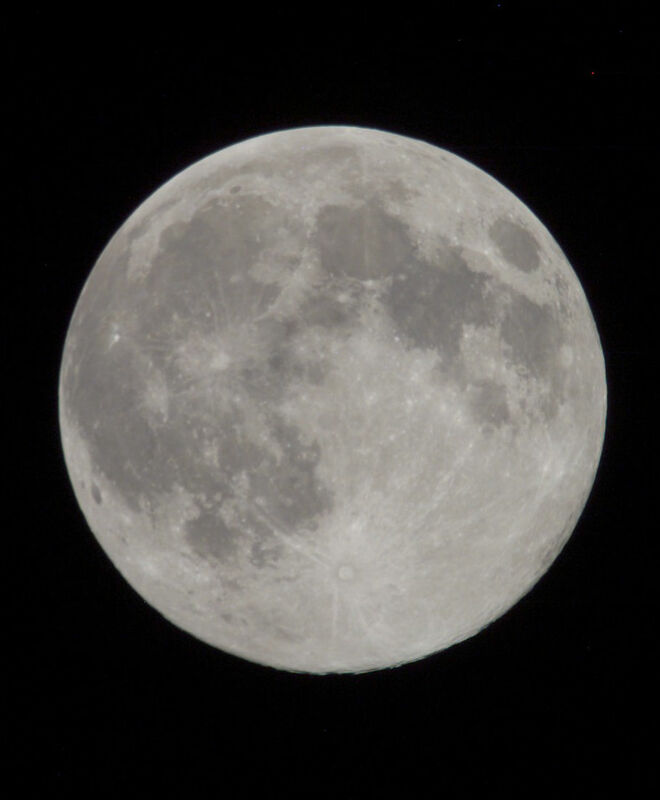 On both evenings, the moon is about 8 degrees from Mars. On the first night it appears to the upper right of Mars as shown in the image above and the upper left on the second night. By month’s end, Venus and Mars have moved farther east compared to the starry background. Venus appears to move between Saturn and Antares, the bright star in Scorpius. 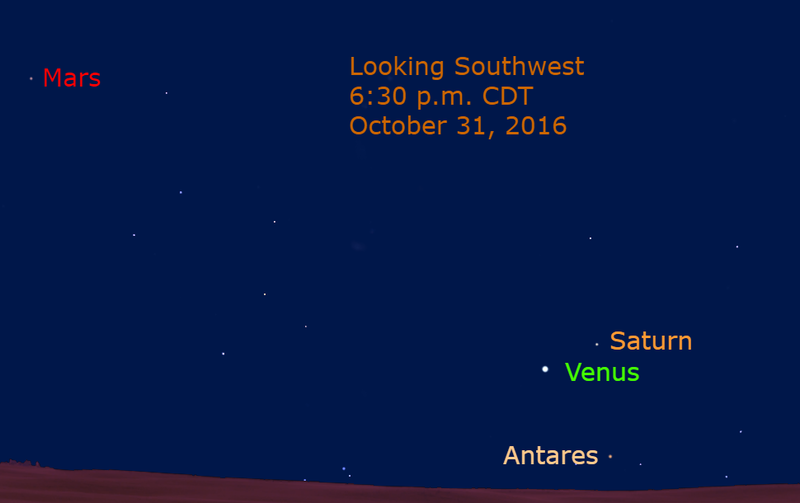 On October 25, Venus passes 3 degrees north of Antares and 3 degrees south of Saturn five nights later. At month’s end the separation between Venus and Mars decreases to 37 degrees. 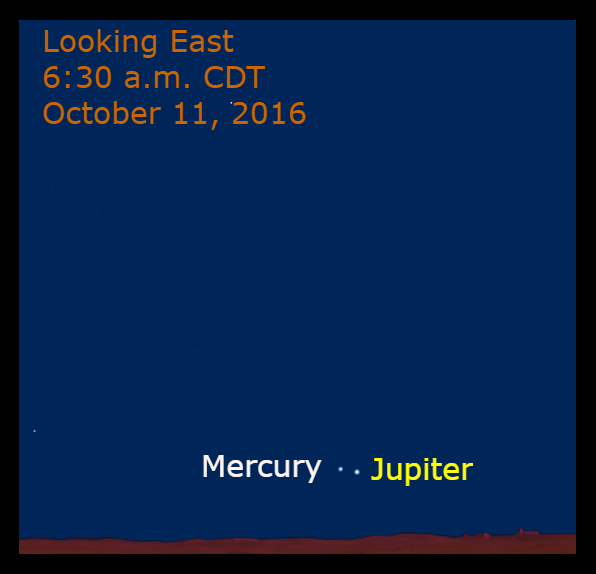 Both the morning and evening skies provide excellent opportunities to view the planets. Take a look.